Select Image - Select the digital image that you want to make a poster out of. Select Paper - Select the paper type that you will print onto. Select Size - Select the poster size and what portion of the source image to include in the poster. Really Detailed How To Page or see the built in Poster Buddy help. The first thing to do is to select the digital image that you want to make your poster from. Possible Sources - Digital Camera, scan of photo, internet, etc. Image Resolution - At least 2 or 3 megapixels is best, but any size can be used. Higher is better. Avoid - Very low resolution (small) email or internet images (e.g. thumbnail images). Next, you tell Poster Buddy about the paper that you are printing your poster onto. Don't confuse this with the poster size. 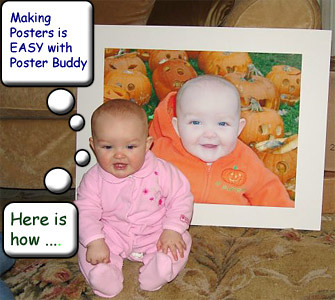 Poster Buddy can make any size poster from any size paper by varying the number of tile images (prints) per poster. Paper sizes - All standard sizes are supported, and custom sizes can easily be added as well. Margin size - This is easily customizable. If you aren't sure about margin size, then it is better to overestimate them. Borderless Printing - Some printers can print from one edge of the page to the other with no margins. This is very handy for making posters since you don't have to trim the margins off of your prints. Use Poster Buddy's Edge Calibration system to ensure top notch results with borderless printing. You then decide how large you want your poster to be by adjusting the "Number of tiles" wide/high. Each "tile" is a print from your printer. At the same time, you customize what part of your source image to include in your poster by using the zoom/pan controls of Poster Buddy. Poster Size - This is calculated by "tile" print size (print paper minus margin size), and number of tiles high/wide. Preview - Click the "preview" button to see a full-screen preview of what the final poster will look like. Estimated Quality - Poster Buddy gives a rough estimate of the final image quality (based on resolution) for the Poster. It should be noted that the perceived "Image quality" greatly depends on how far away the poster is viewed from. Poster Buddy creates a new folder and saves your poster images into that folder. You can specify the new folder name and location, as well as the filenames and format of the poster images. You can use any application to print your images, or the Windows built in print function. When you print your poster tile images, try to avoid any printer settings that either crop or automatically adjust your images. Windows Printing - When printing with Windows's built in print wizard, select the "Fax" layout option. Do NOT select the "Photo" layout option (that setting cuts off parts of your images). Printer Settings to Avoid - Try to avoid any printer settings that automatically adjust the lightness/colors of images. Also, avoid any layout settings that might crop your images. Poster Assembly - You first need to trim off the margins from the tile prints (not needed for borderless prints). You then tape the tiles together from the back. For an even nicer finish, mount the poster on poster board or put it in a frame. Frames and poster board are inexpensive and really add to the look and feel of the poster.